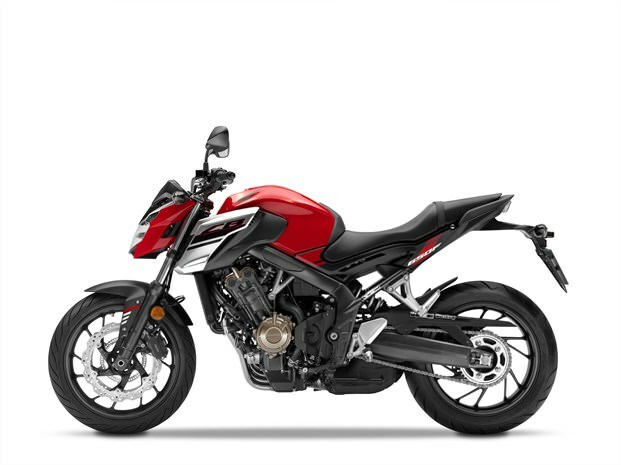 2018 Honda CB650F Review / Specs | All-New Naked CBR Motorcycle for the USA! 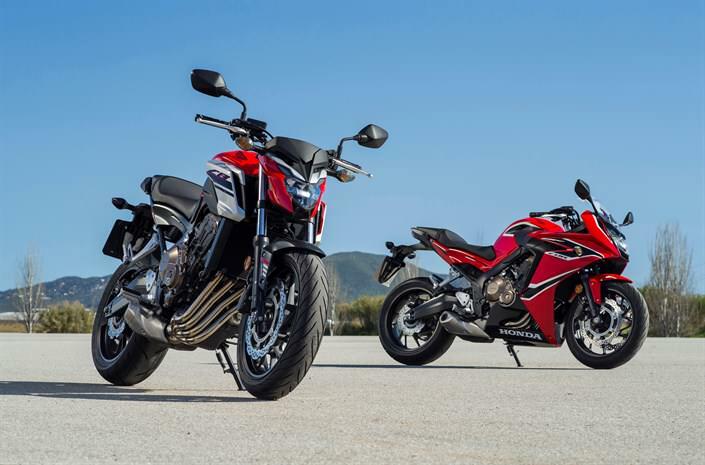 2018 Honda CB650F Review / Specs | All-New Naked CBR Sport Bike / StreetFighter! 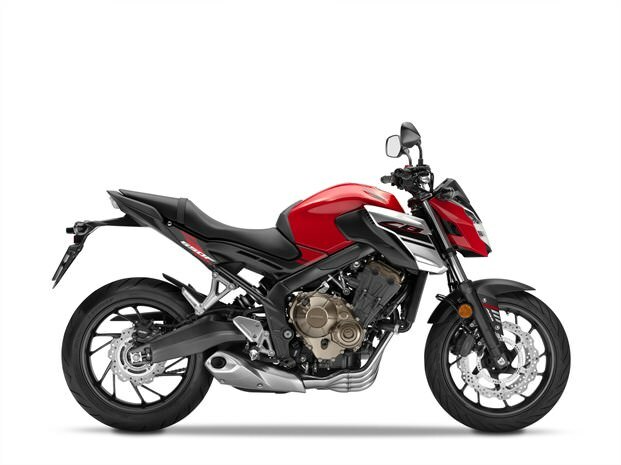 Say hello to the All-New 2018 Honda CB650F! 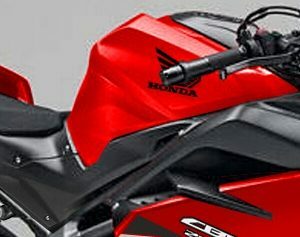 Well, kinda sorta “all-new”… Why do I say that? 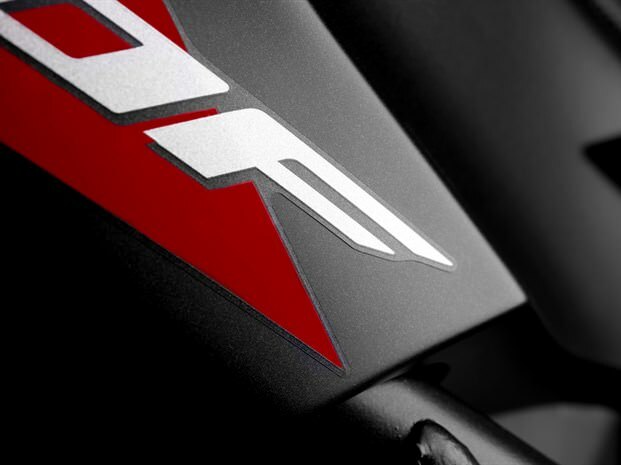 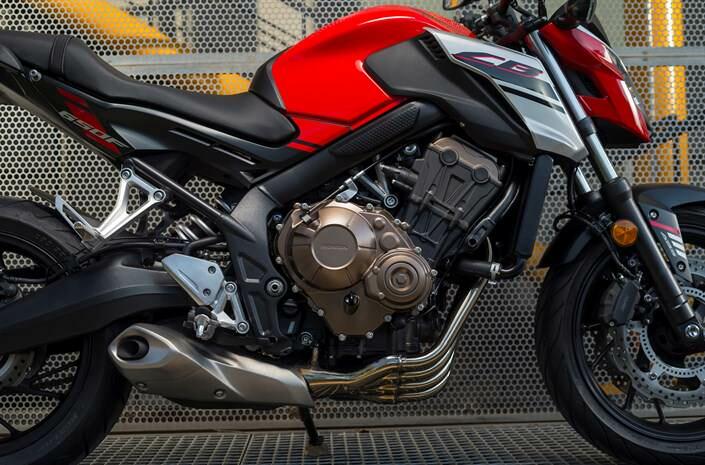 Well, the CB650F has been in production for a few years now in other countries around the world while we have been deprived of this awesome naked streetfighter CBR (based off of the CBR650F) – until now! 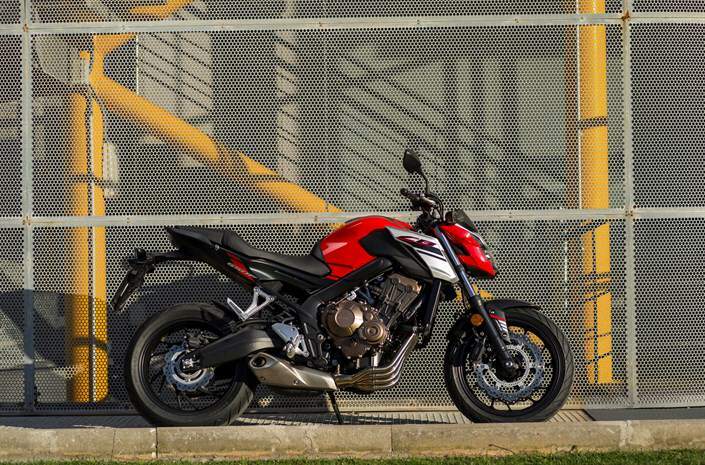 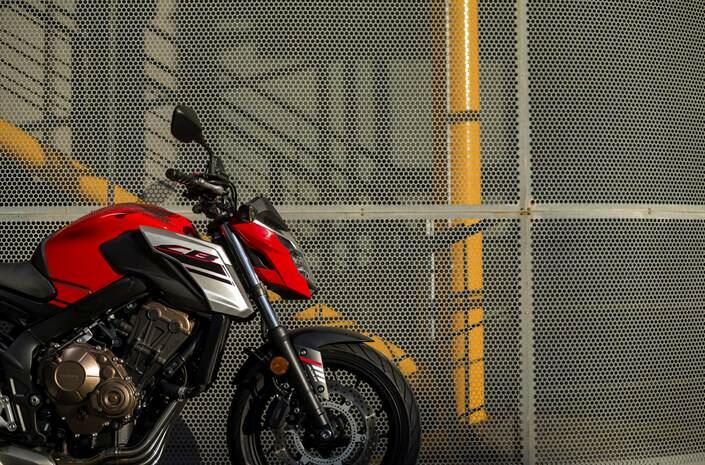 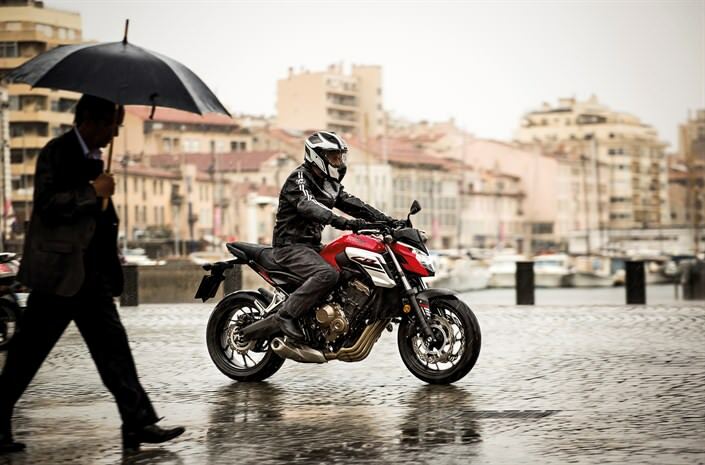 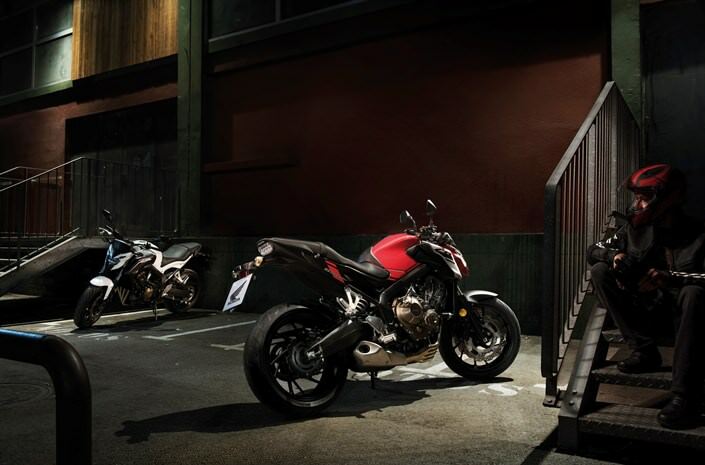 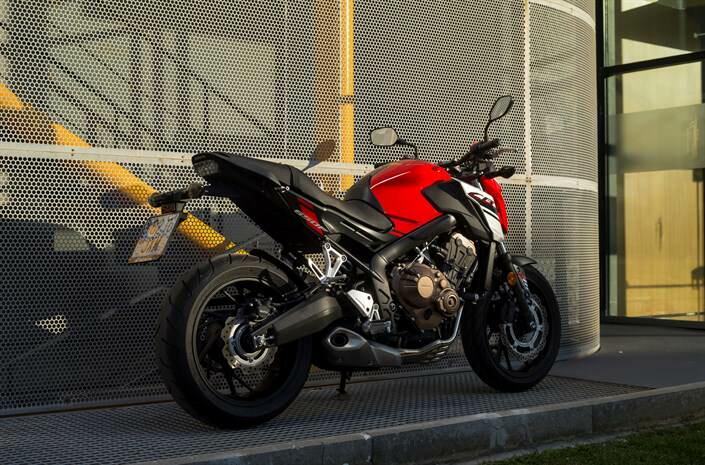 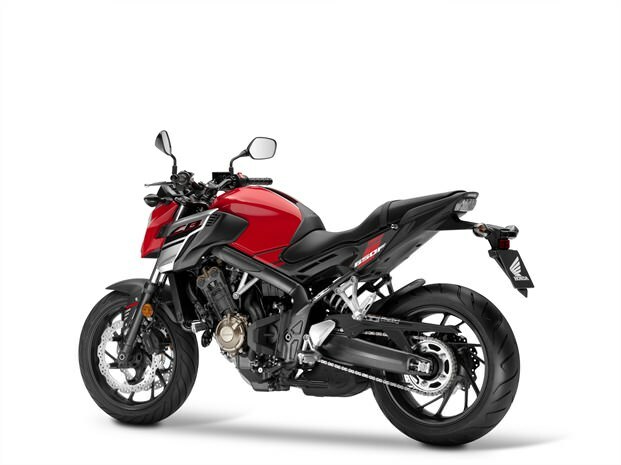 The naked sport bike market has been booming the last few years after dieing off greatly back in the mid-2000’s so Honda decided to step up their game and bring us a new model to slot in next to the 2018 CB500F and 2018 CB1000R. 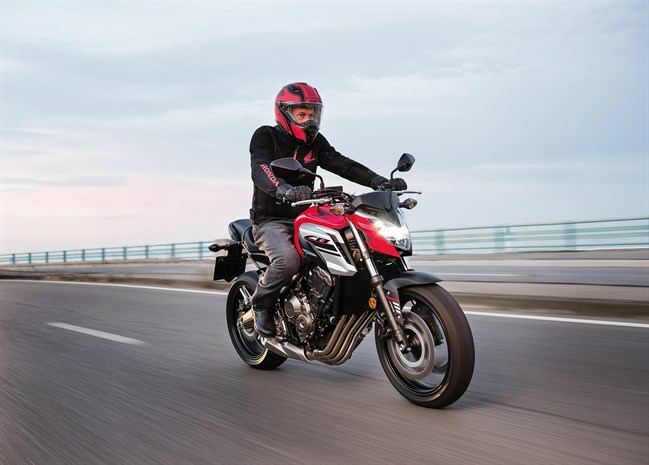 Below, we’re going to break down all of the nitty-gritty specs and features behind the CB650F and hopefully help you decide whether or not this is a bike you should entertain buying or if it’s one to mark off the list. 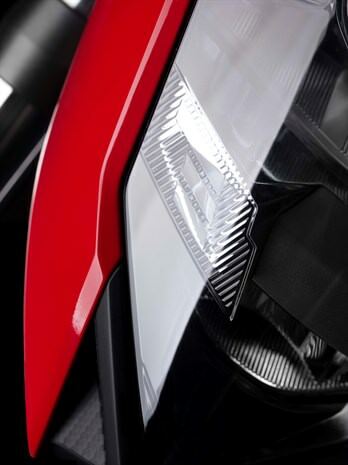 If you find any of the information helpful, please take a second and slap that “Like” button and Share – it’s greatly appreciated guys! 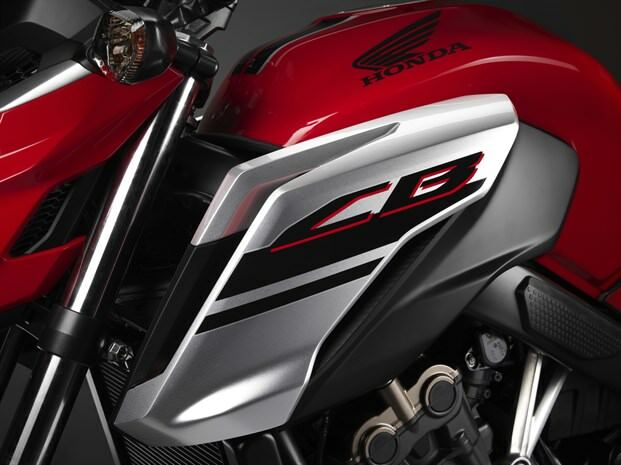 The four-cylinder CB range has a proud history dating back to 1969 and the ground-breaking CB750. 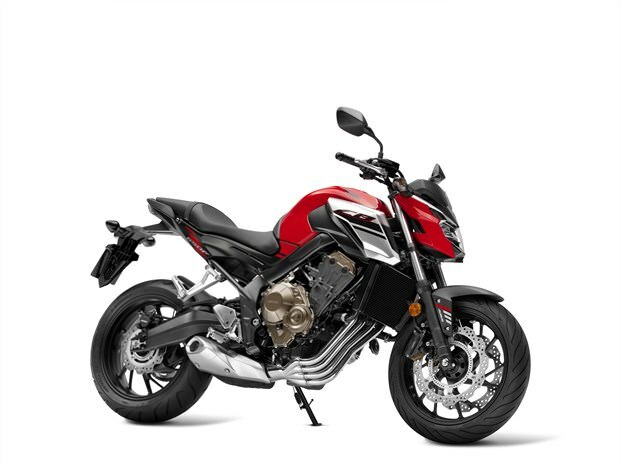 Within that history, Honda’s middleweights have always found starring roles, thanks to the poise and usability produced by their combination of low mass and strong engine performance. 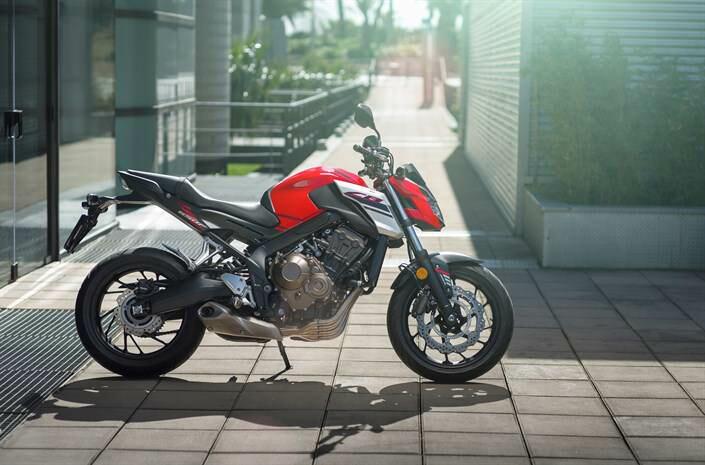 The CB650F, continues the tradition. 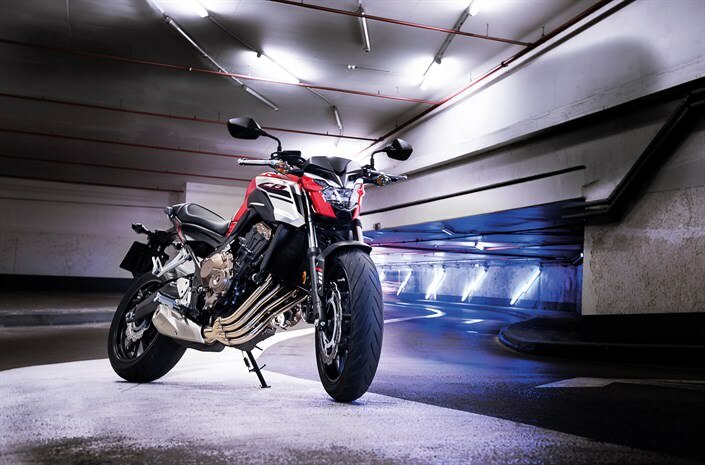 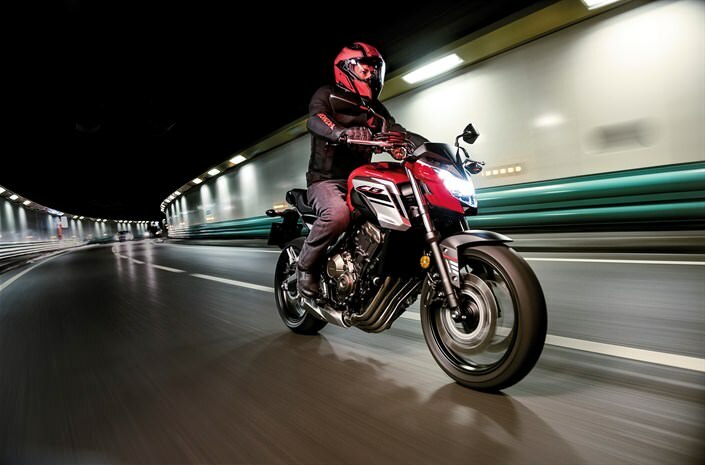 Designed by a young team of engineers, it harnesses the lightweight form and high quality engineering of all mid-capacity Hondas – with a special nod to the seminal 1970’s CB400 from its side-swept exhaust downpipes – and injected an exciting new jolt of energy and naked streetfighter style. 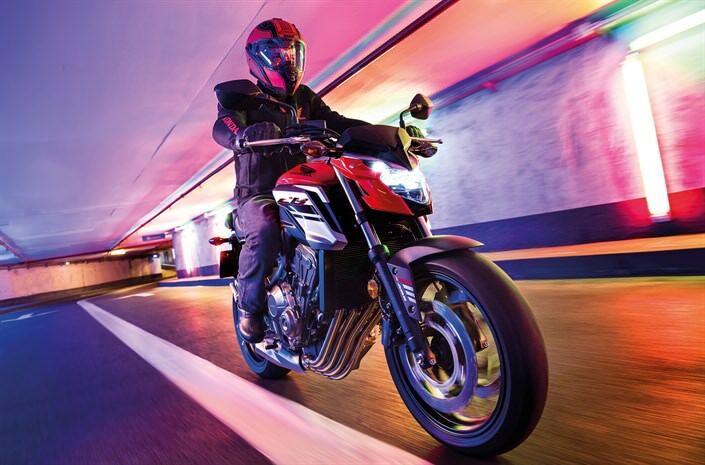 In recent years, the trend has been toward ever-larger capacity mid-sized machines. 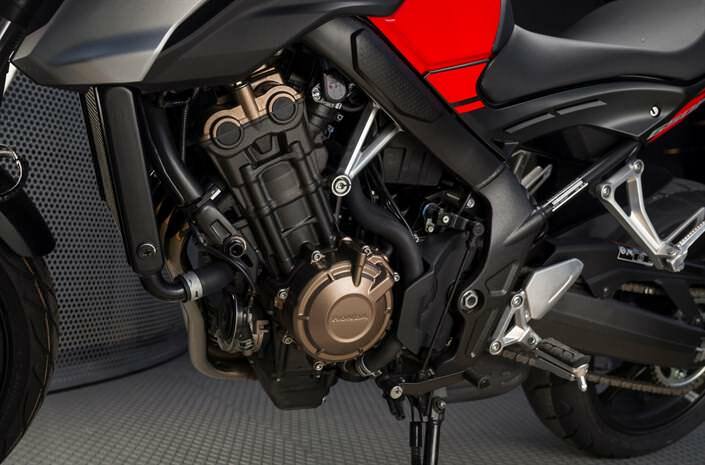 The four-cylinder middleweight has long been a key machine within the wide range of Honda motorcycles. 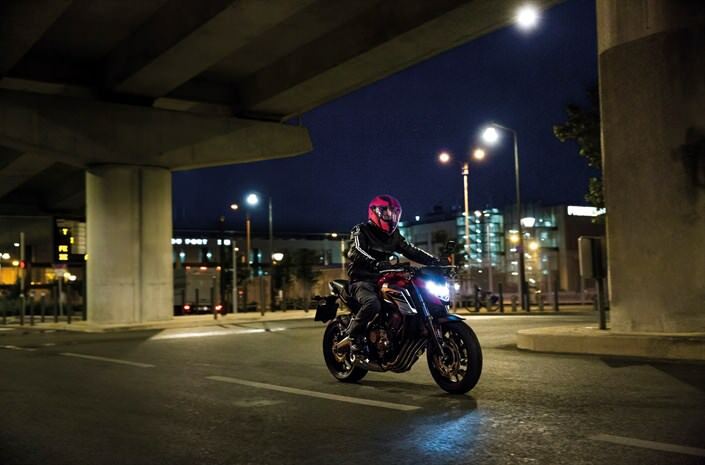 Genuine middleweights provide accessible and enjoyable engine performance tied to minimal mass, giving the kind of pound-for-pound performance that makes a great place from which to begin – or resume – a motorcycling career. 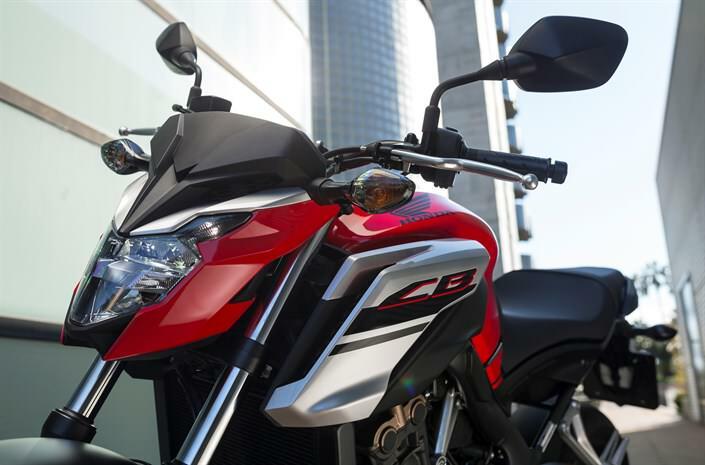 The CB650F turns the Page on the older CB 599 also known as the CB600F Hornet overseas and, sharing no common parts, starts a fresh chapter. 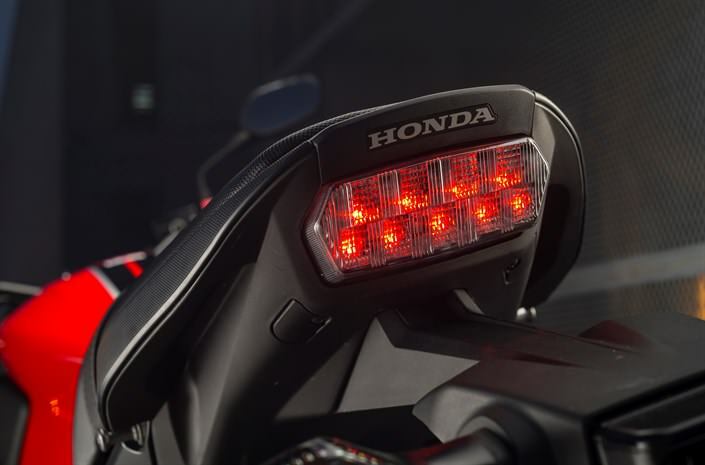 Brand new from the wheels up – conceived and developed by a young team of Honda engineers – the concept behind its performance is completely different. 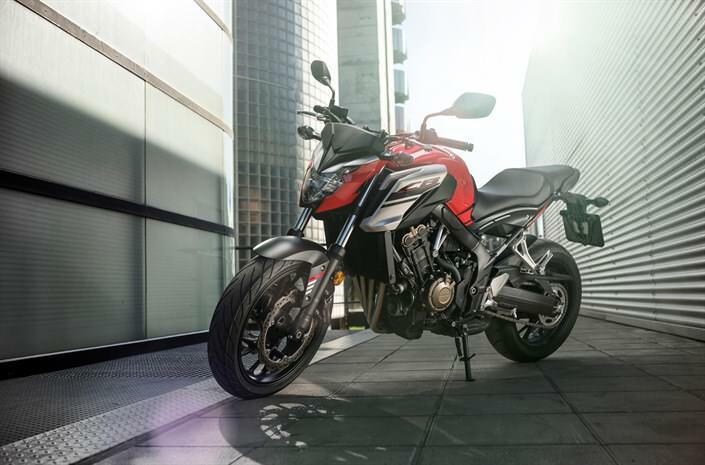 It’s been designed from the outset to put the rider fully in tune with the machine and offer arresting style, identity and attitude. 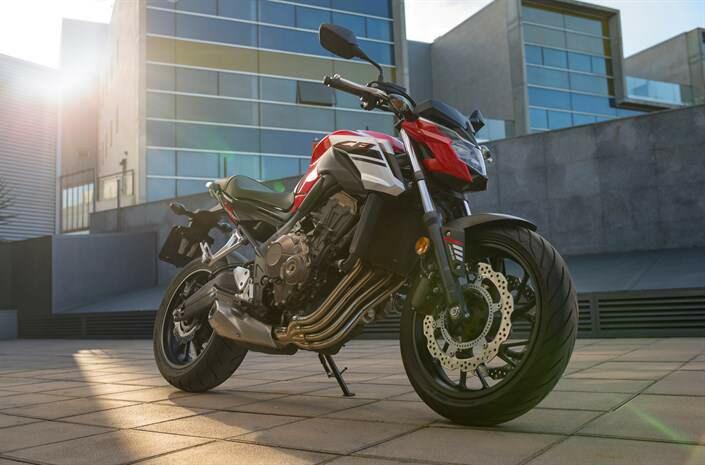 The DOHC 649cc four-cylinder engine powering the CB650F is engineered to deliver high torque and response through the low-to-mid rpm range, especially below 4,000rpm. 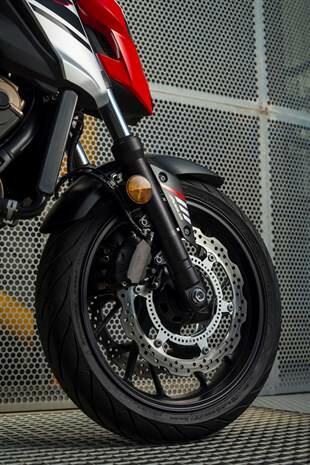 Also, since she’s a four-cylinder – you can twist it all the way up to 11,000rpm. 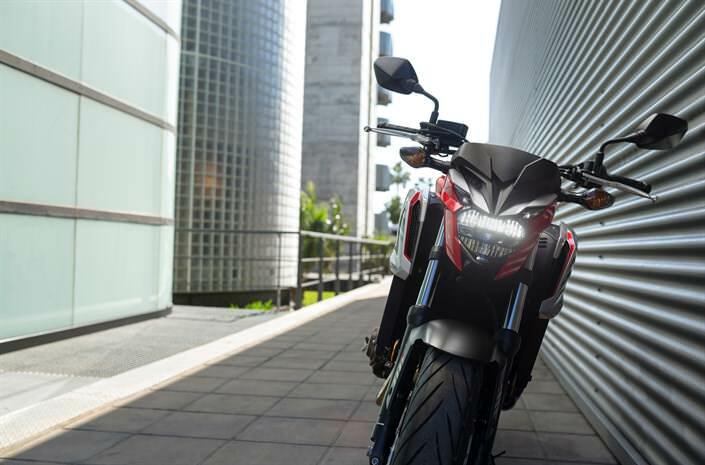 The development team included many engineers in their twenties, selected to produce a bike with a focus on the younger customer. 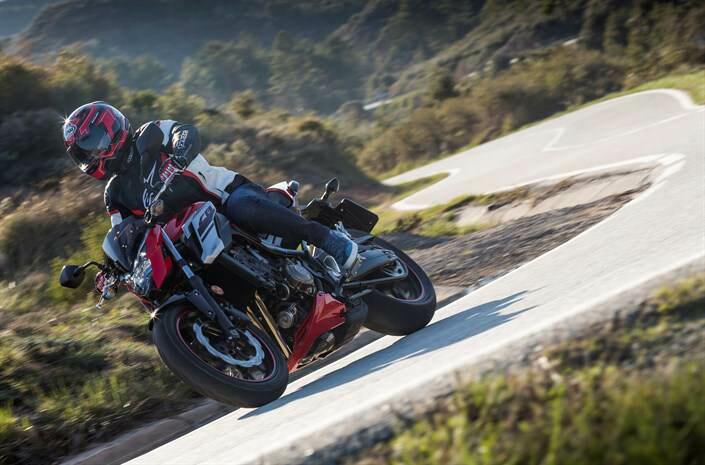 They decided early on that chasing peak power at redline was off the agenda. 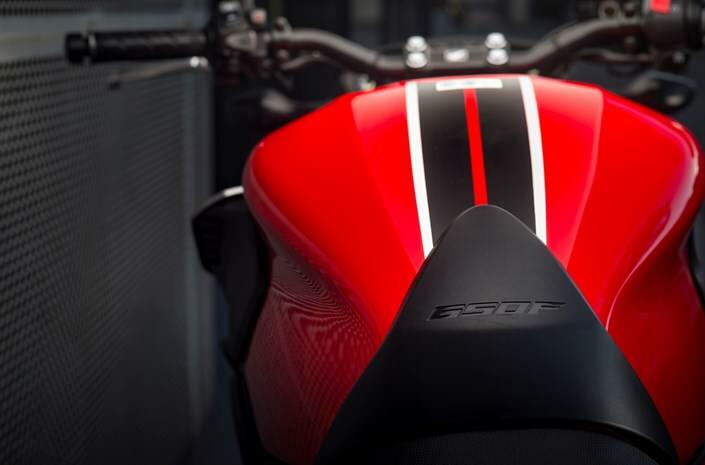 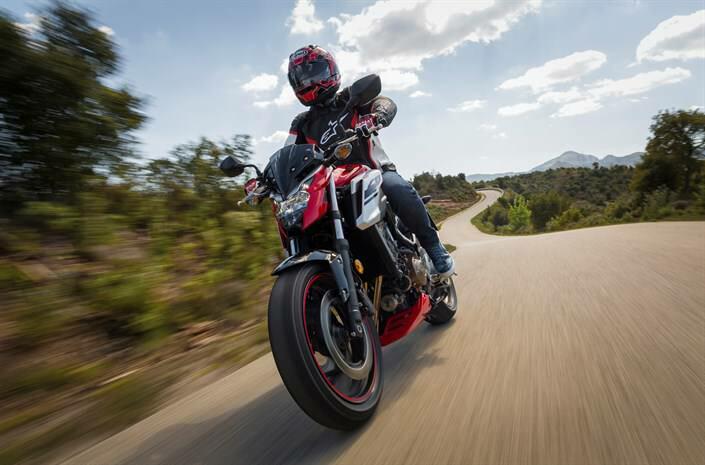 On a naked machine, strong acceleration from a standing start, low/mid-range torque and mid-gear roll-on throttle response were targeted as the essential elements. 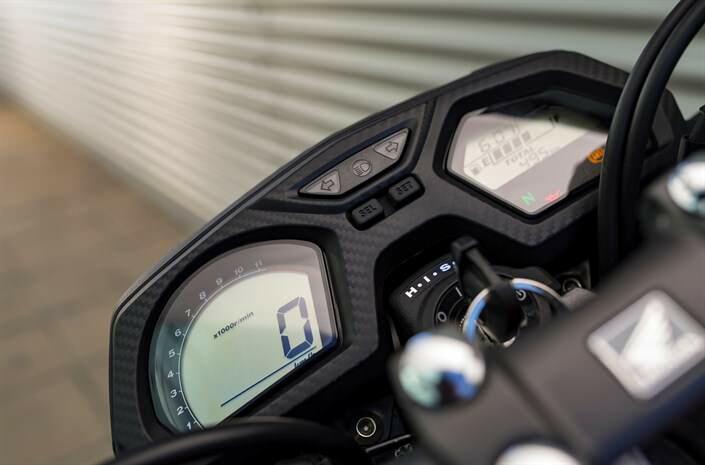 Crisp pick-up above 6,000rpm and – for the sake of reduced running costs – economical cruising at highway speeds was also a focus. 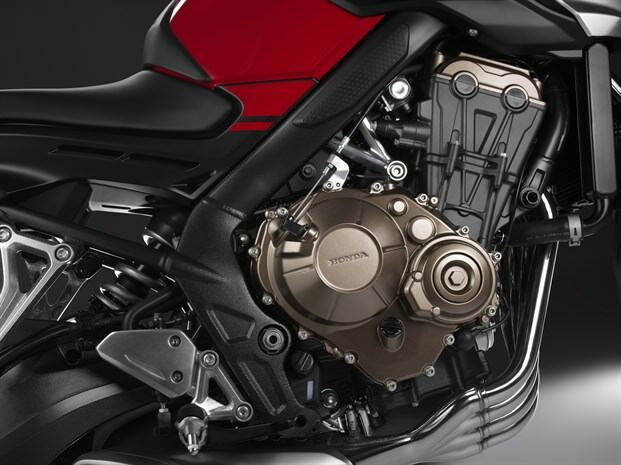 The engine has also been designed to look good, with no external plumbing obscuring its lines. 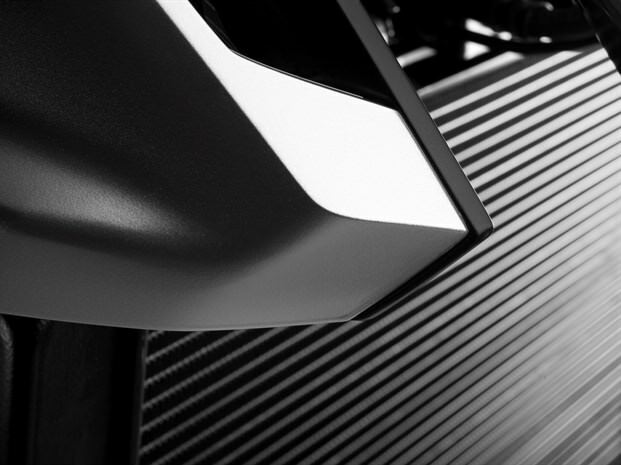 Sitting relatively far forward in the chassis for optimal weight distribution, the engine is truly at the heart of the machine. 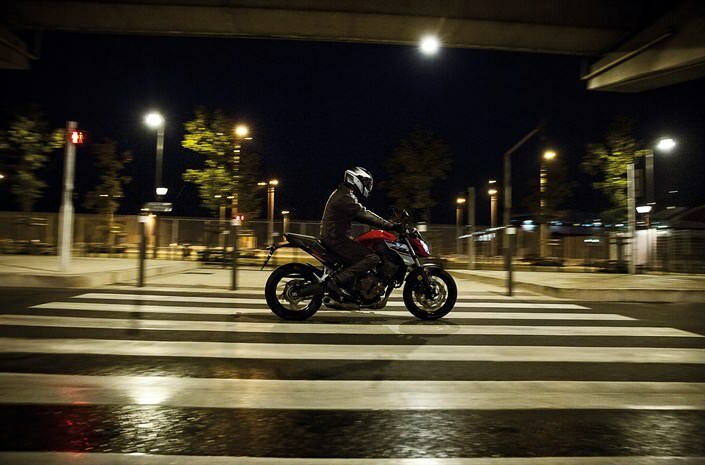 Crisp, aggressive lines and angular silhouette give the CB650F real visual appeal and even better at night when the LED lights are lit up while the low center of gravity, slim feel, upright riding position and wide handlebars give excellent control when paired up with the Showa Dual Bending Valve front fork setup. 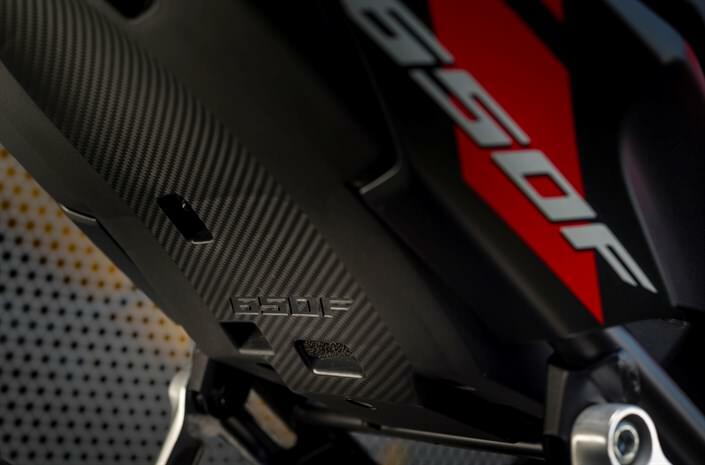 * The release date, colors, price are for USA spec models. 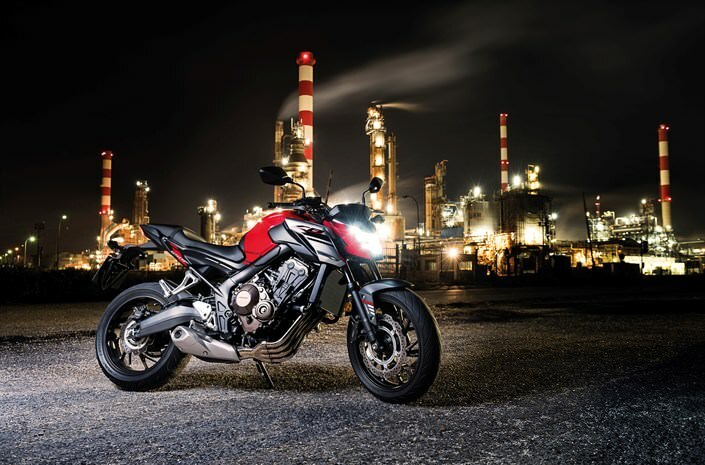 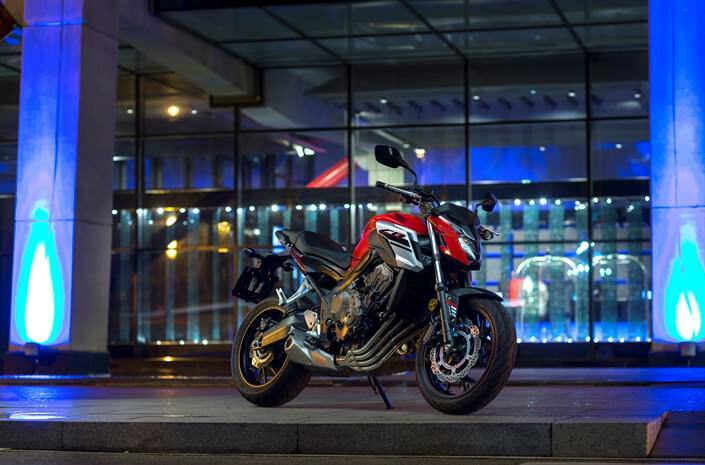 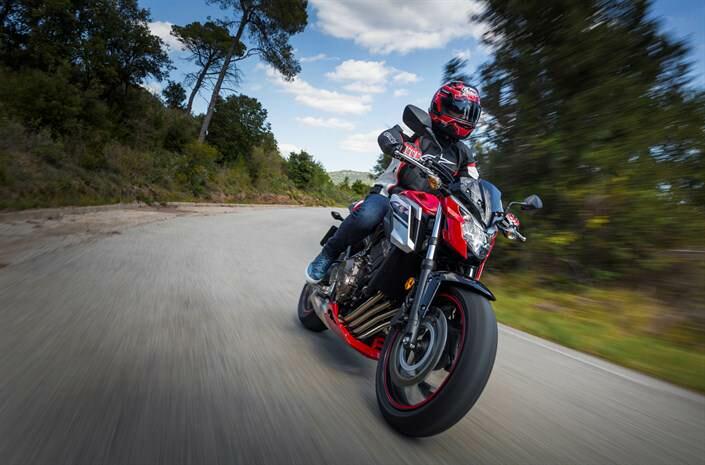 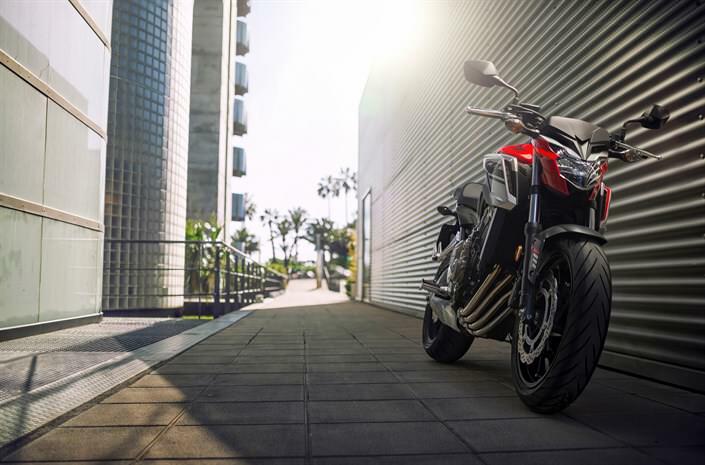 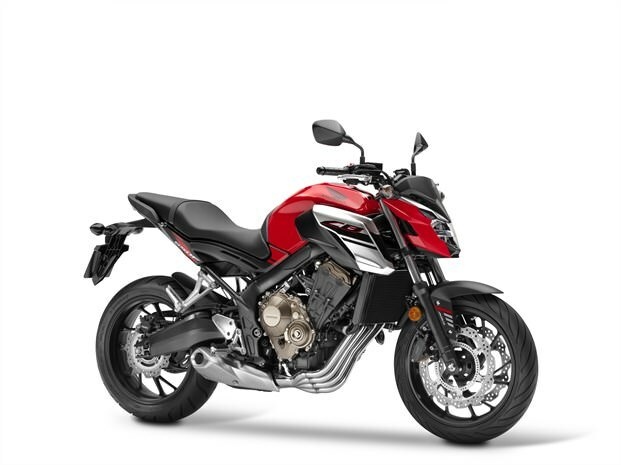 The CB650F’s liquid-cooled engine uses compact internal architecture, stacked six-speed gearbox and starter/clutch layout with the four cylinders canted forward 30°. 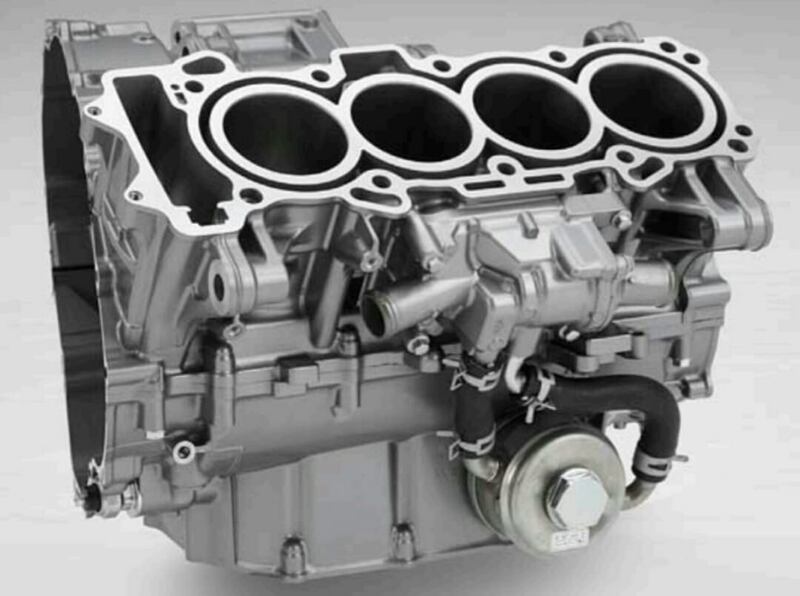 The DOHC 16-valve cylinder head employs direct cam actuation and cam timing that equals strong torque performance and drivability below 4,000rpm. 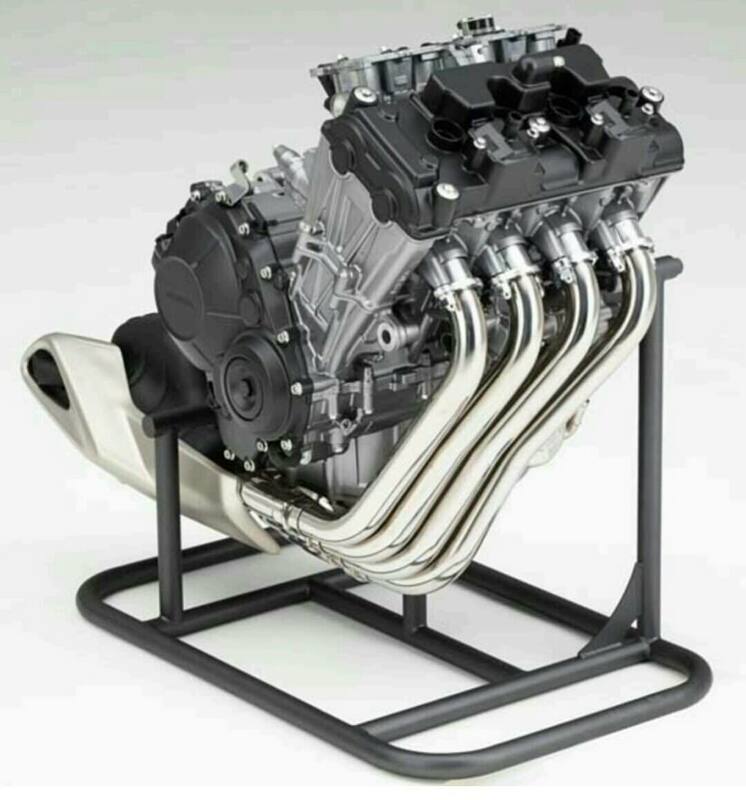 Bore and stroke is set at 67mm x 46mm. 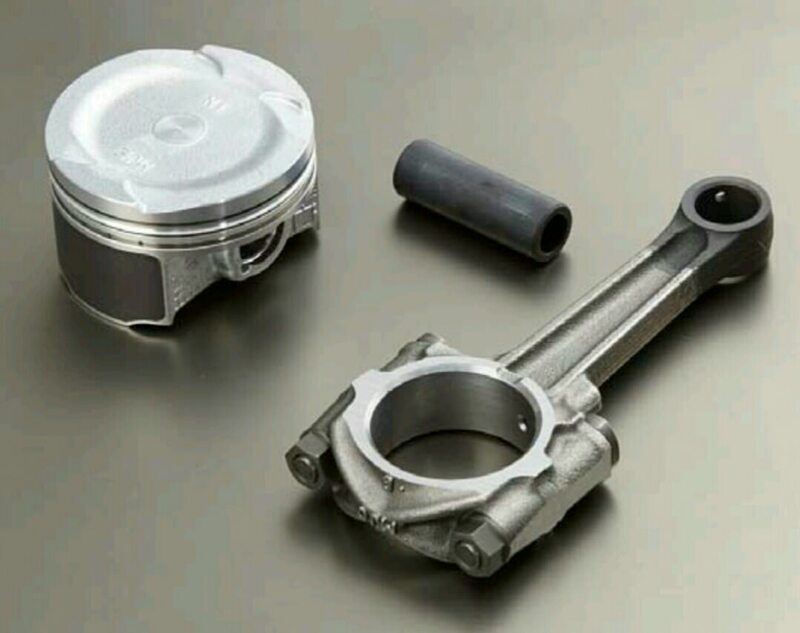 Optimization of connecting-rod length has decreased the side-force on each piston and ‘breathing’ holes in the crankcase walls between the journals reduce pumping losses as rpm rises. 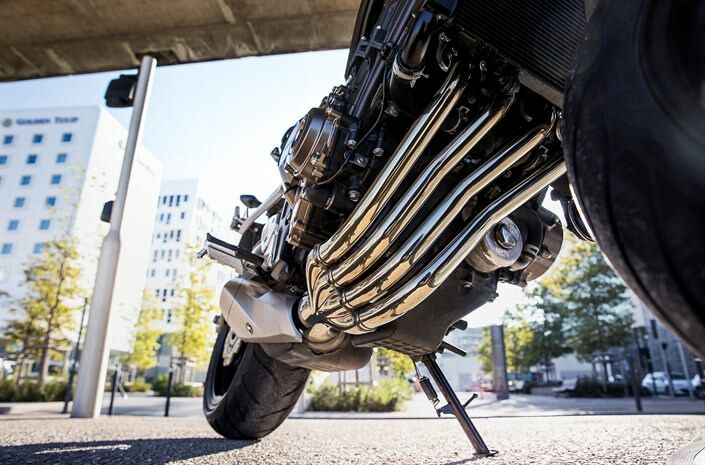 The pistons were developed with Computer Aided Engineering (CAE) and asymmetric skirts minimize bore contact and reduce friction. 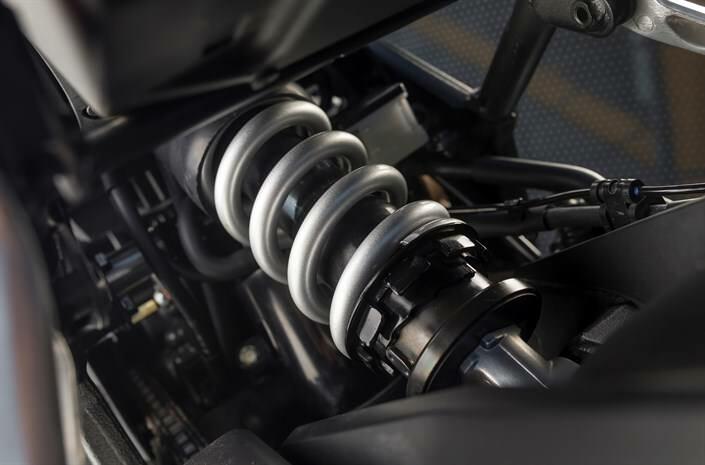 Ferrous spines on the outer surface of the cylinder sleeves reduce oil consumption (and friction) with improved heat transfer. 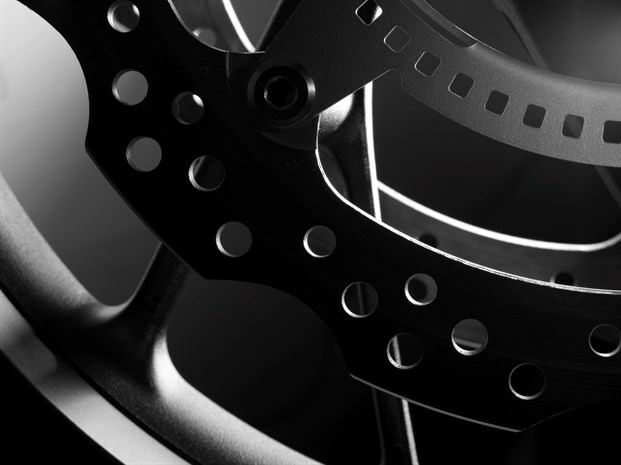 A silent SV cam chain reduces frictional losses by using a Vanadium coating on its pins and the water pump – designed with CAE study of water flow – is compact, light and efficient. 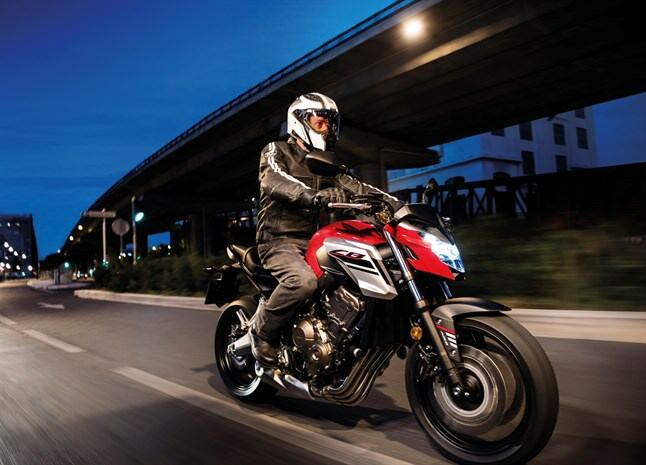 Peak horsepower for the 2018 CB650F arrives at 11,000rpm with peak torque of 47 ft/lbs torque at 8,000rpm. 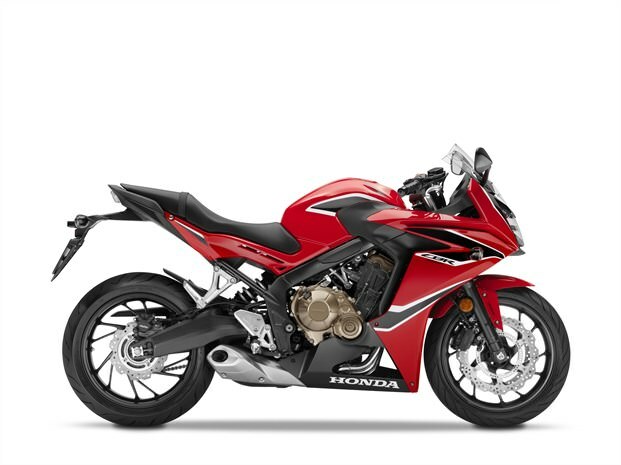 The engine is smooth at all rpm, with distinct inline four-cylinder character and resonance. 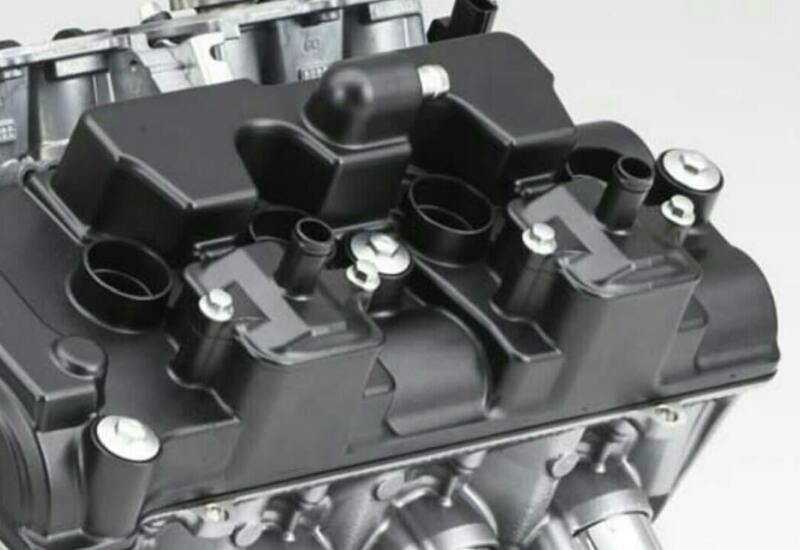 Internal water channeling from cylinder head to cylinders does away with a great deal of the exterior hoses normally required and the motor shows off its minimal, elegant beauty and functional style. 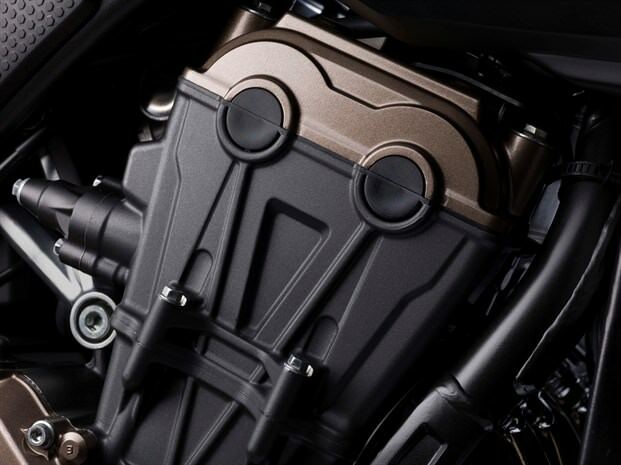 The layout of the oil filter (behind the engine) and oil cooler (front left) plus internal oilways further enhance the visual appeal and has enabled use of an evocative right side-swept 4-2-1 exhaust. 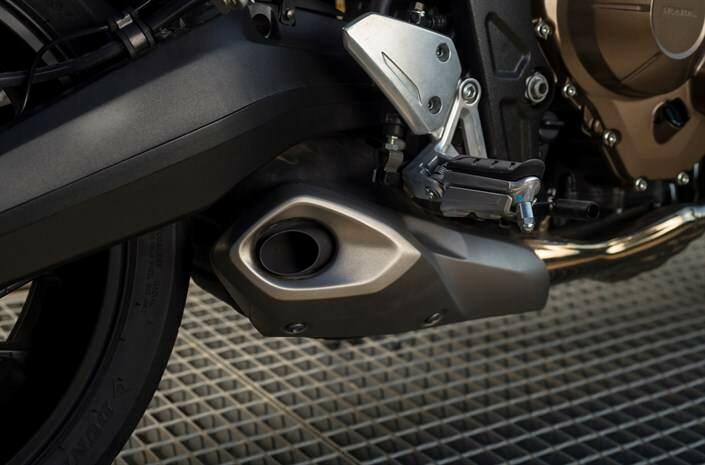 With strong echoes of the original Honda 1974 CB400/4 the design employs optimized downpipe length and diameter, plus patented internal plates regulating airflow to improve torque. 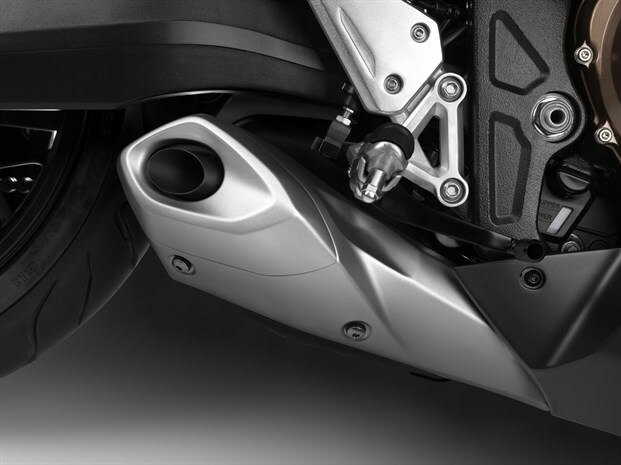 The ‘wafer’ design stubby underslung muffler – with 400-cell catalytic converter – contributes to mass centralization. 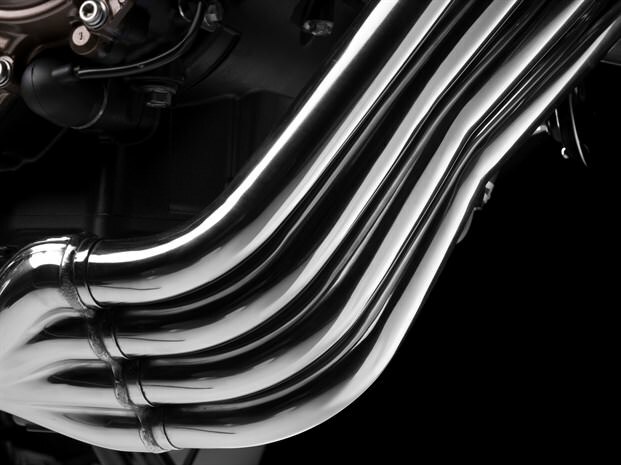 PGM-FI fuel injection is fed through a down-flow airbox and narrow 30mm high-velocity funnels, with intake gas flow routed in as straight a line as possible. 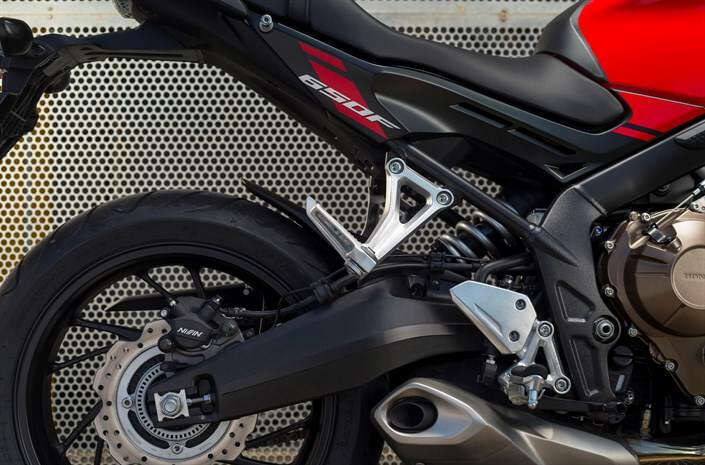 It operates with information from four separate throttle body sensors on 32mm throttle bores for crisp and accurate throttle response. 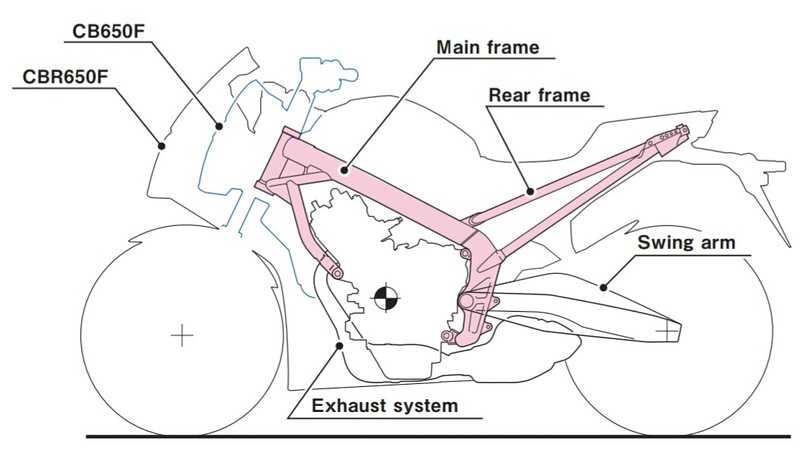 Careful siting, position and angle of the throttle bodies allow a narrow frame width, improving manageability for the rider. 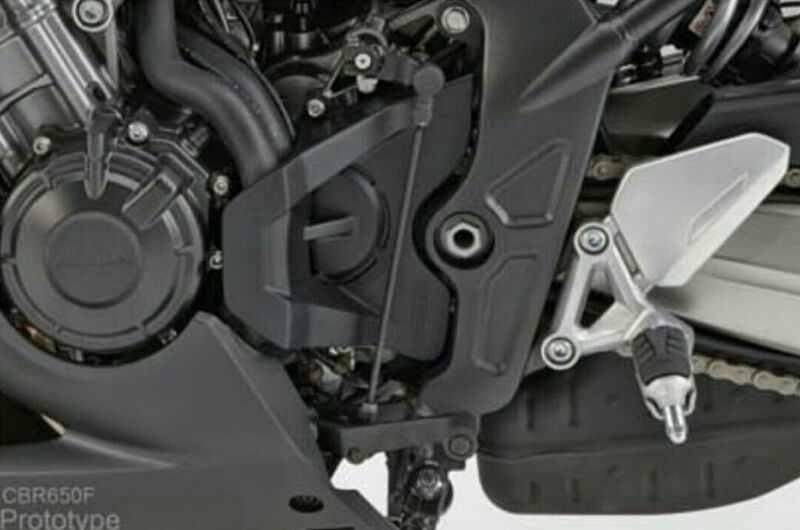 To deliver good fuel economy at constant throttle (cruising at higher speeds) short valve overlap timing works with a specific ignition map. 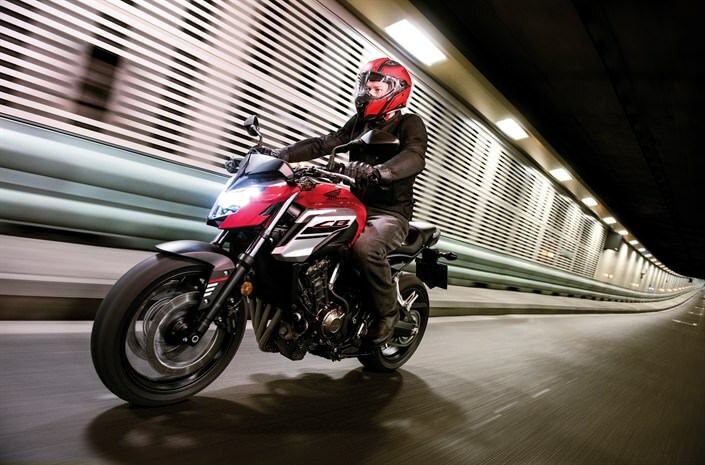 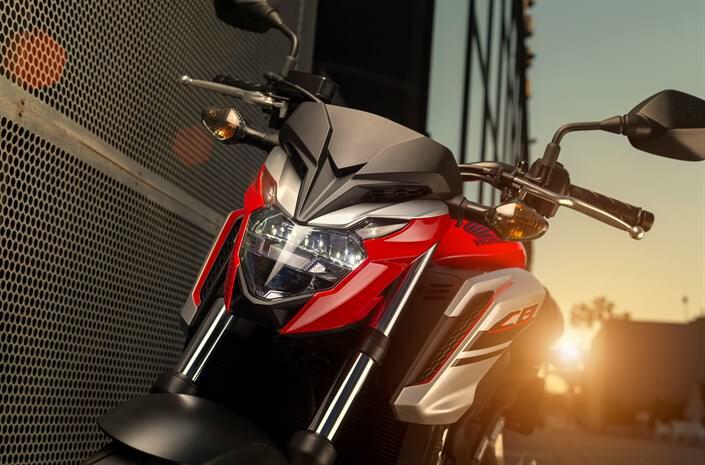 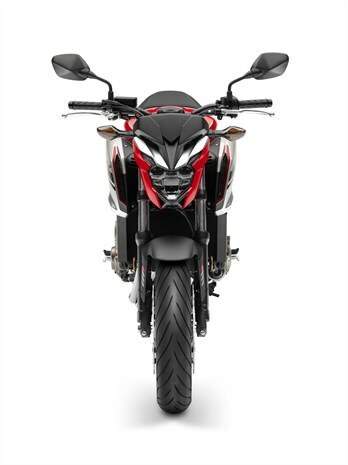 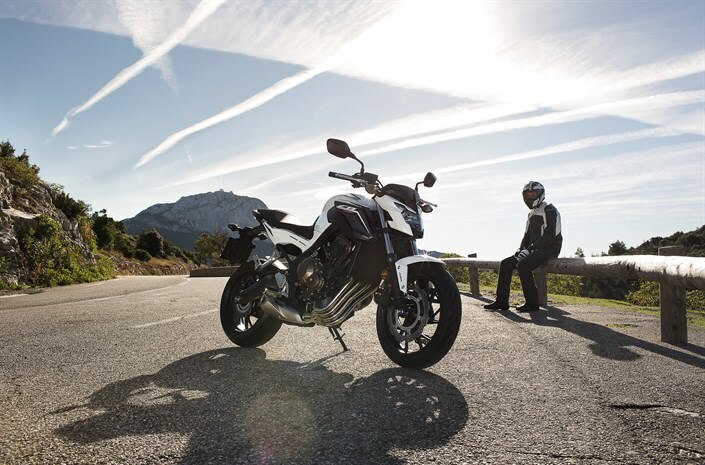 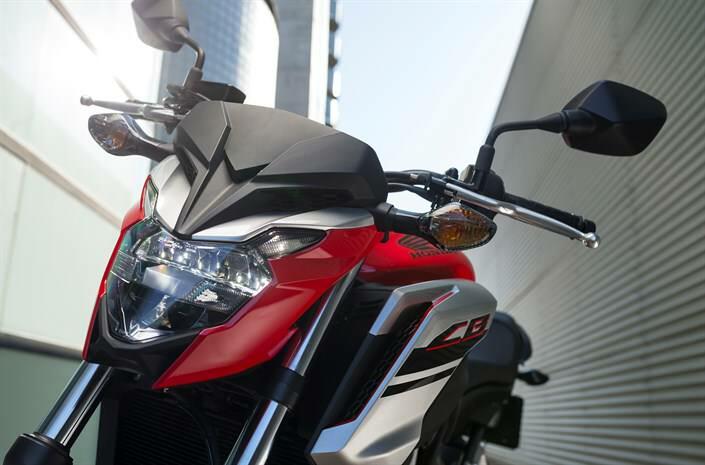 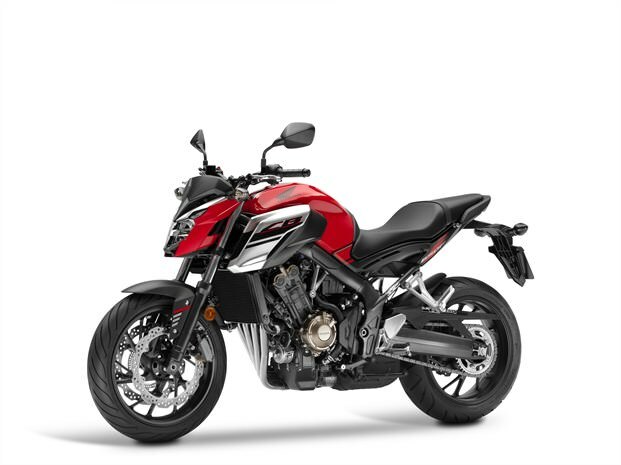 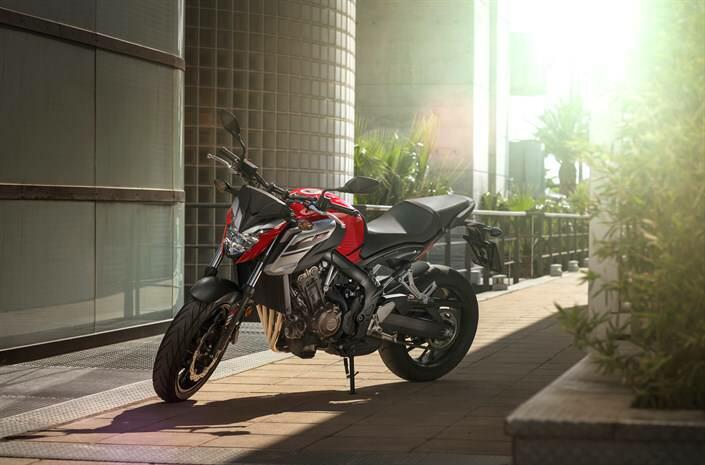 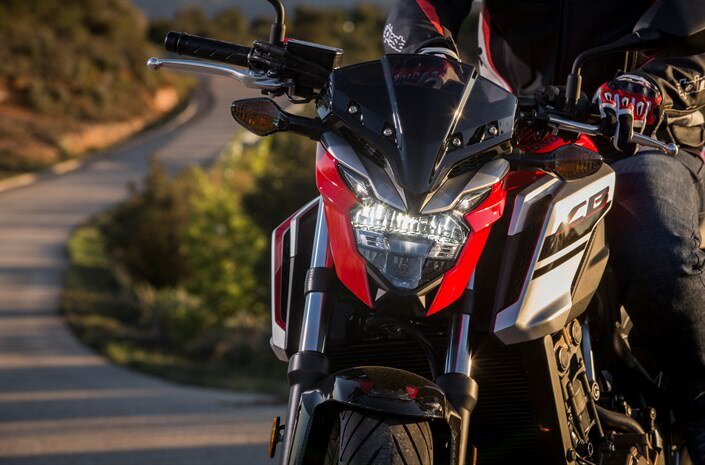 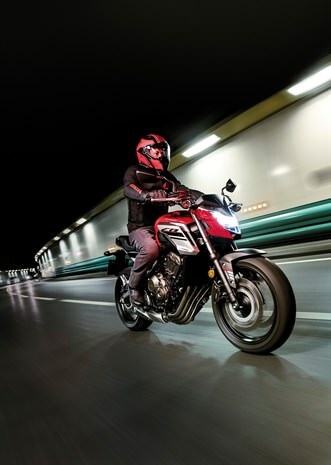 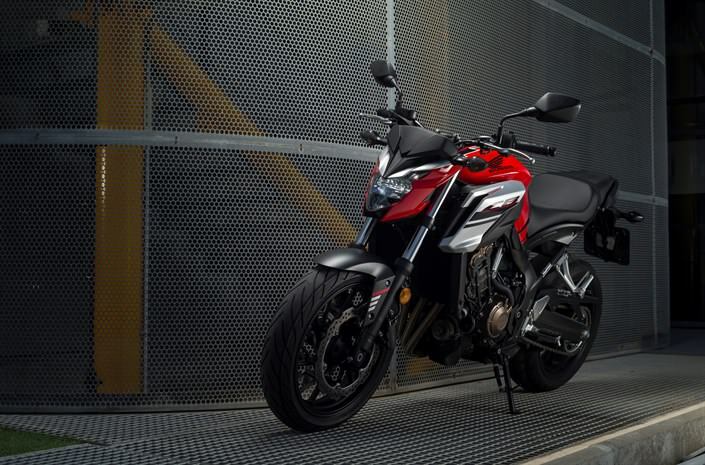 The 2018 CB650F comes in with a fuel consumption rating of 49 MPG(21km/l) which gives a range of over 217 miles (350km) from the 4.57 gal (17.3L) fuel tank. 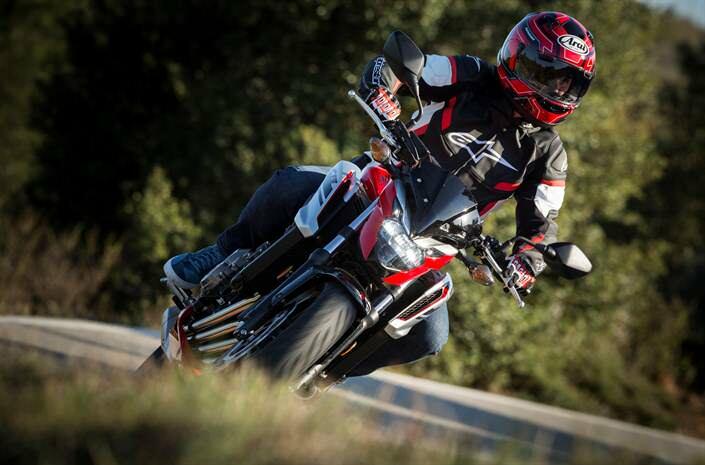 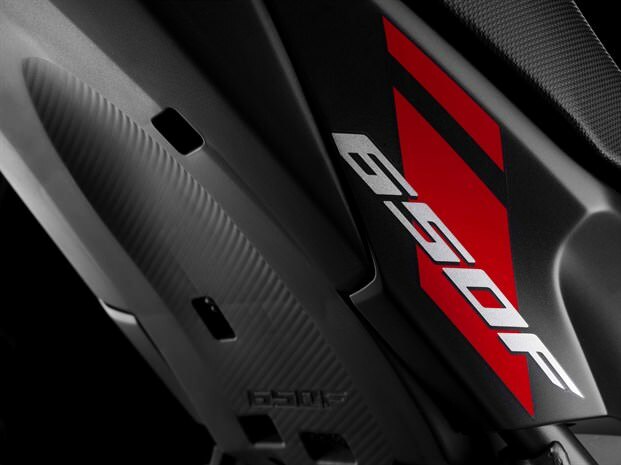 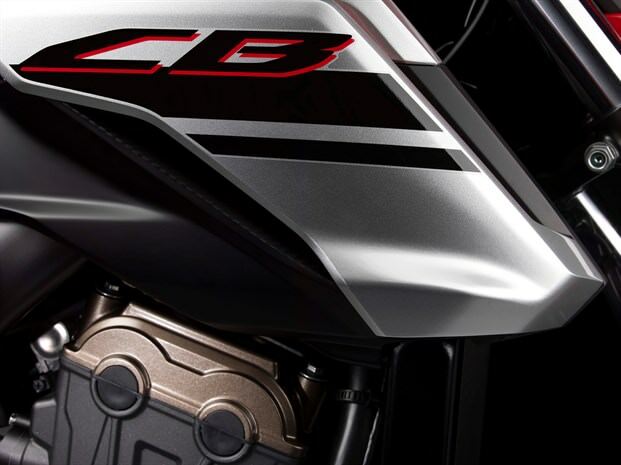 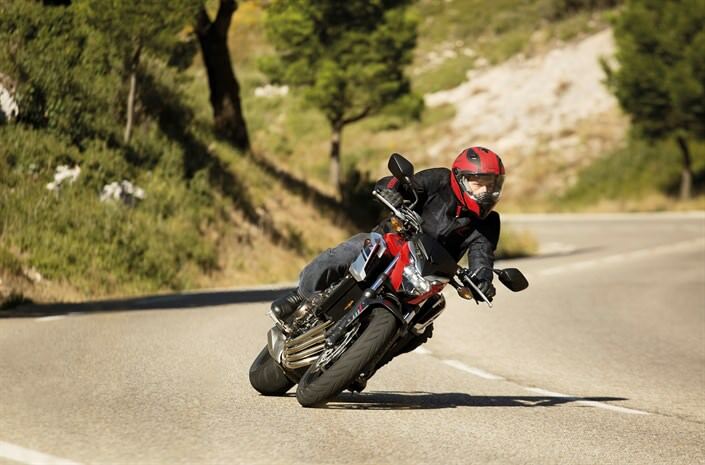 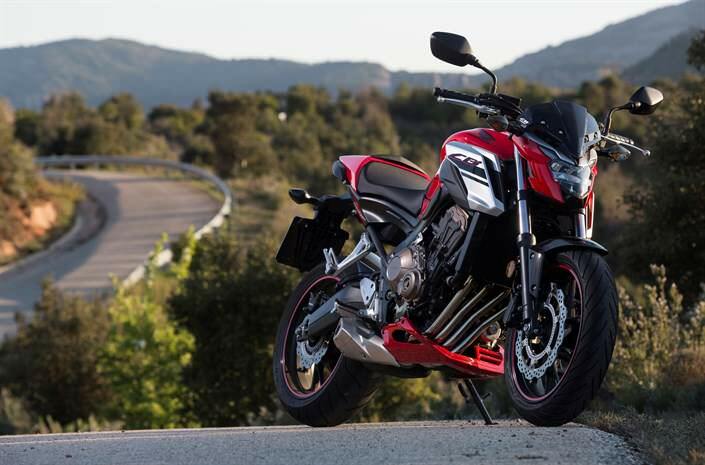 The CB650F engine is EURO 4 compliant. 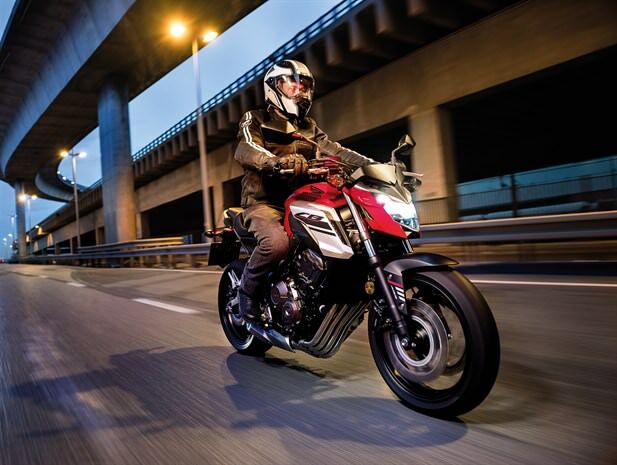 The CB650F’s steel diamond frame uses twin 64mm x 30mm elliptical spars with a rigidity balance specifically tuned (stiffer around the headstock and more ‘flexible’ in the spar sections) to deliver balanced handling characteristics with high levels of rider feedback. 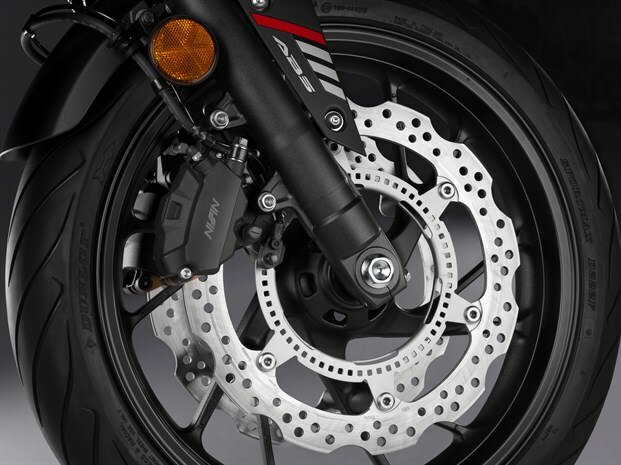 Rake is set at 25.5° with trail of 101mm and wheelbase of 57 inches. 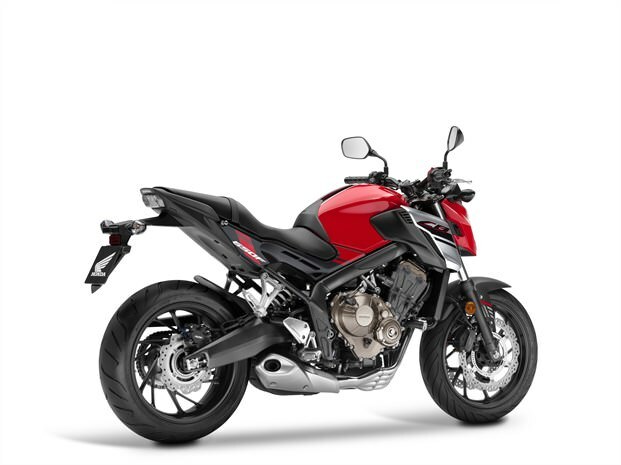 The 2018 CB650F curb weight is 454 lbs and 459 lbs for the ABS model. 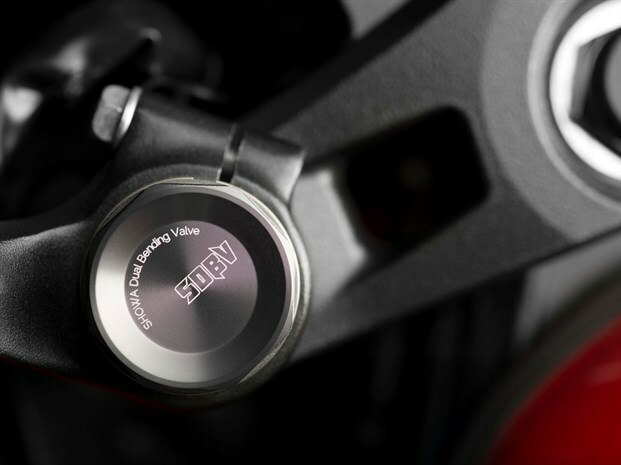 The 41mm Showa Dual Bending Valve (SDBV) front fork offers up a comfortable yet precise front-end feeling, delivering proportional rebound damping with firmer compression damping as the 120mm stroke is used up. 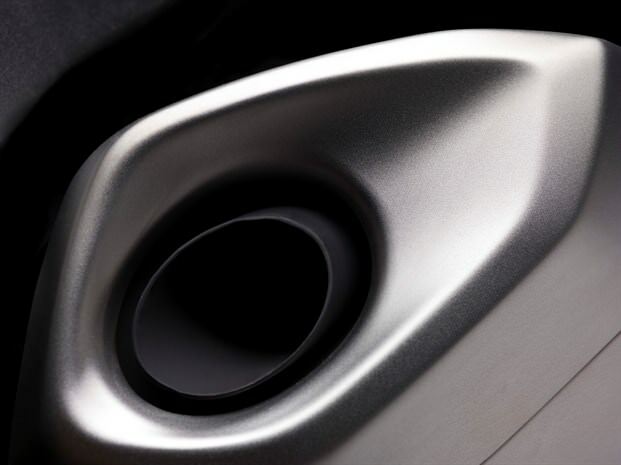 Octagonal fork caps are finished in attractive Alumite. 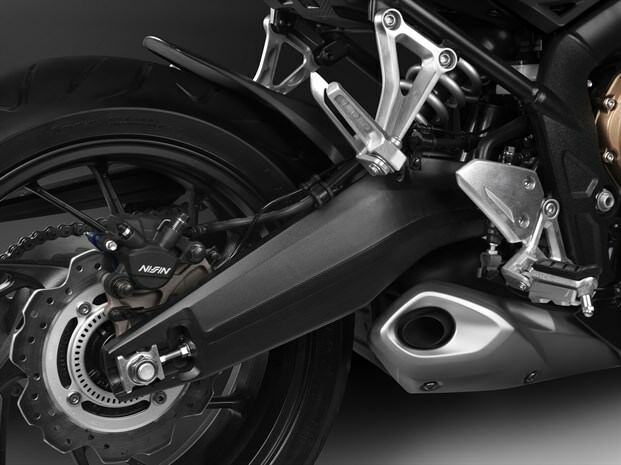 Adjustable for 7-stage spring preload the single-tube monoshock operates directly on the curvaceous gravity die-cast aluminum swingarm. 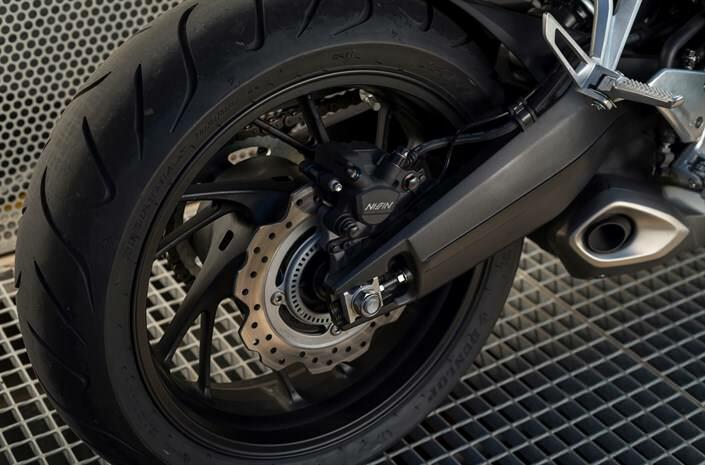 The swingarm pivot plate is forged then welded together, while the gravity die-cast aluminum swingarm features a curvaceous shape that arcs over the muffler on the right. 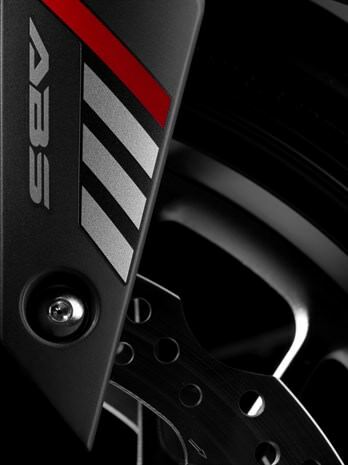 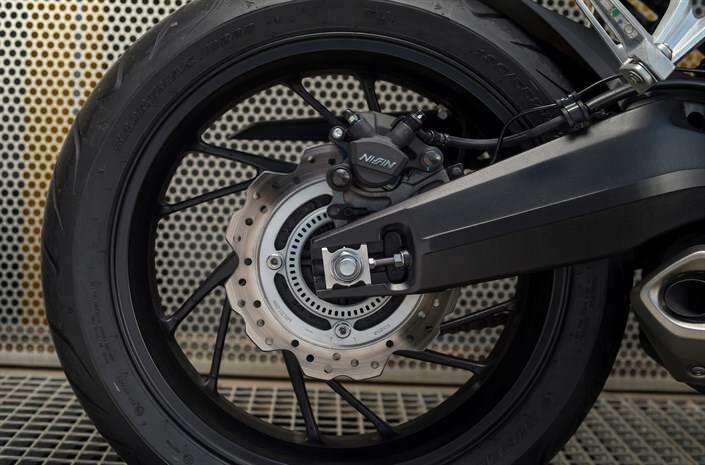 Adjustable for 7-stage spring preload the single-tube monoshock operates directly on the swingarm. 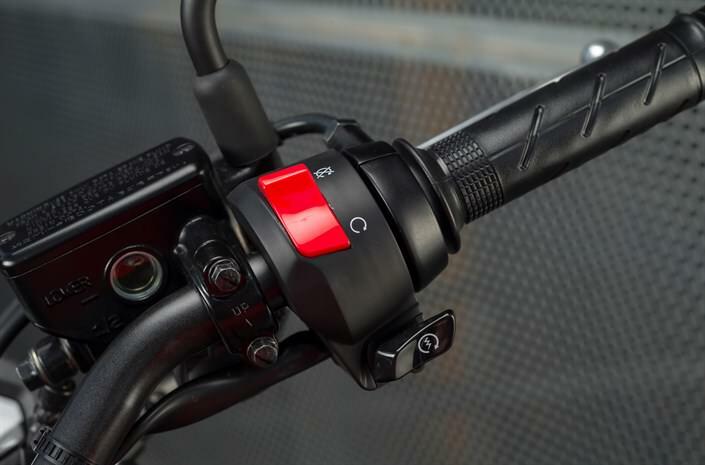 Both the rear shock and 41mm telescopic fork (with 120mm stroke) have been developed to work directly with the frame’s performance dynamics to provide supple, neutral control in all conditions. 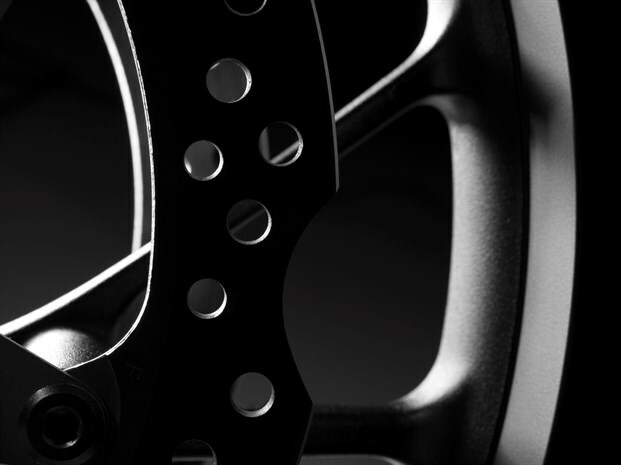 Cast aluminum six-spoke wheels wear 120/70-17 and 180/55-17 front and rear radial tires feature L shaped air valves for easier maintenance. 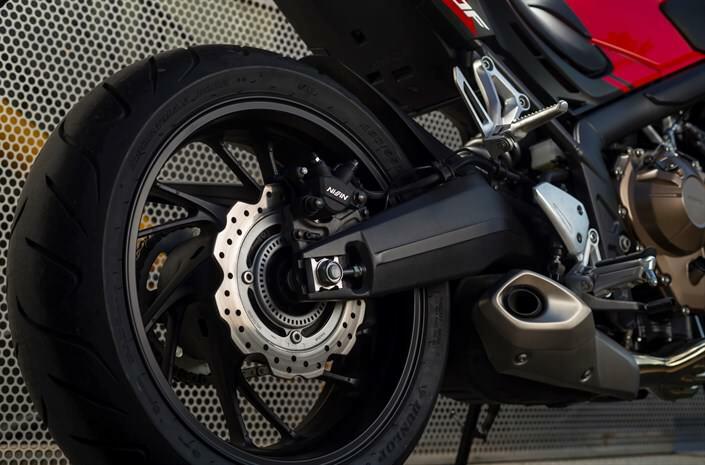 That may not sound like a “big thing” but once you play around with motorcycle tire air pressures for a while, you get spoiled by just how much easier it is with you have the L shaped valve. 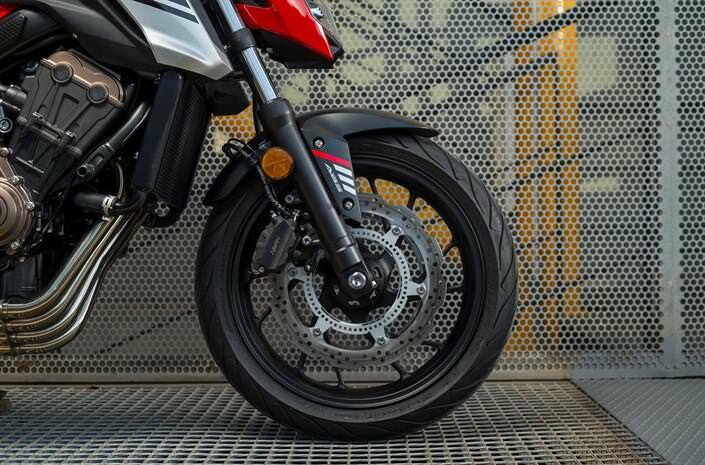 The wave brake rotor discs use the same manufacturing technique as the twin-cylinder NC750 series: the 240mm rear is formed within a 320mm front, saving material (and ultimately cost) to the customer. 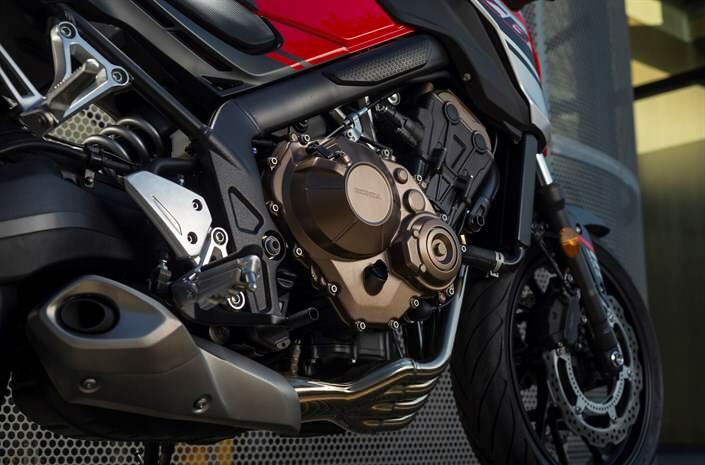 The two-piston front calipers and single-piston rear provide plenty of stopping power, with 2-channel ABS an option for the 2018 CB650F. 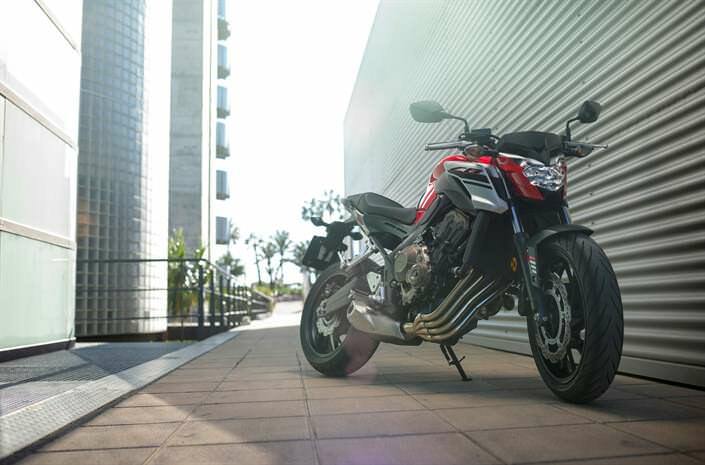 A ‘Mass Forward’ stance with minimal front and rear overhang gives the CB650F its muscular appearance, hunched and ready for action. 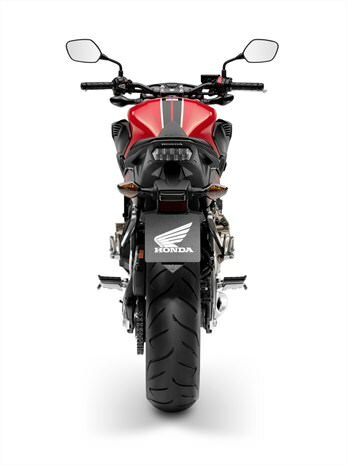 The short fuel tank, shroud covers and sharp nose fairing add dramatic presence as does the stubby, shrink-wrapped upswept tail unit. 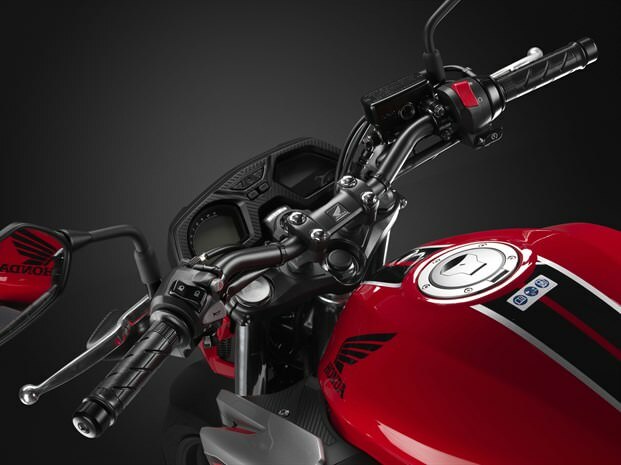 Hinged at the back, the tank allows easy access to the cylinder head for maintenance. 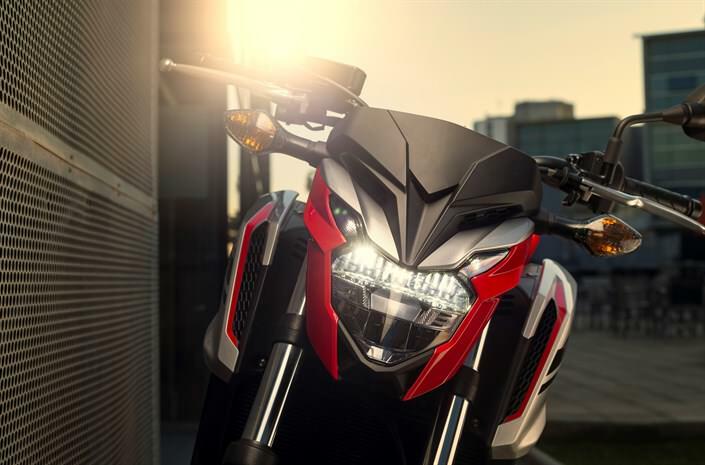 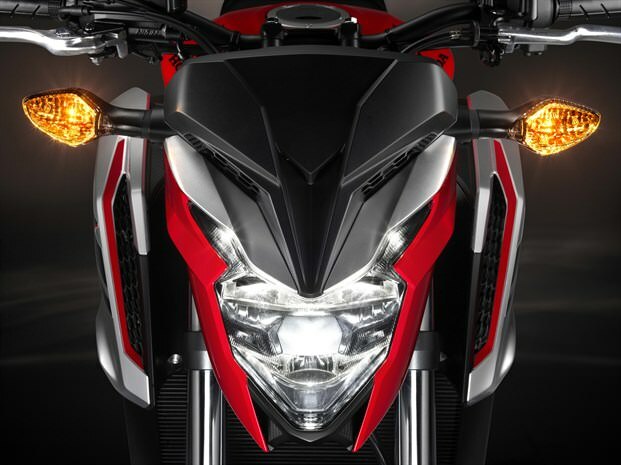 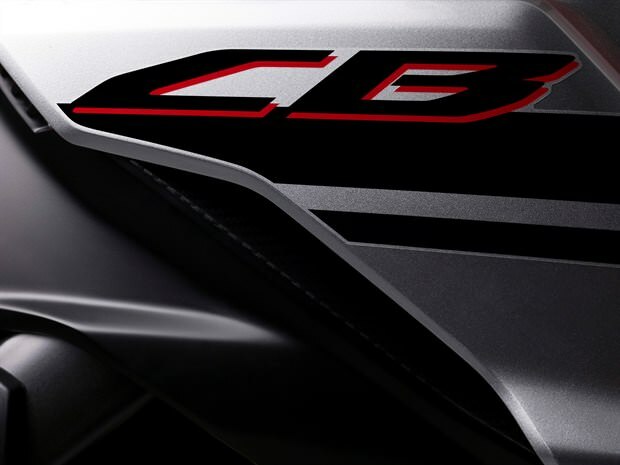 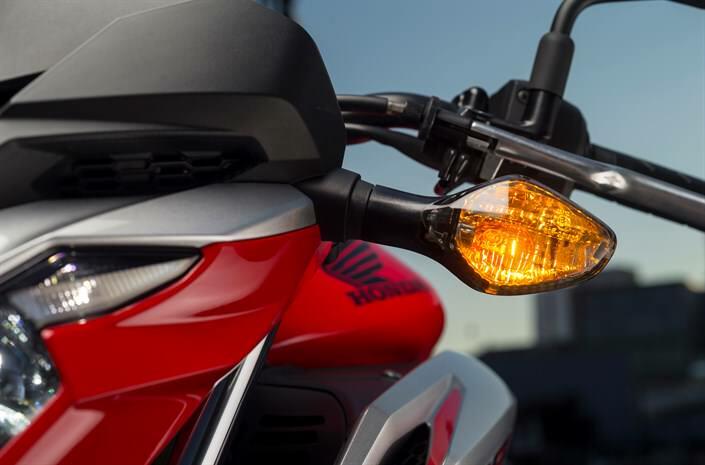 Both taillight and front position lights are LED and the headlight uses the distinctive ‘CB’ V-shape. 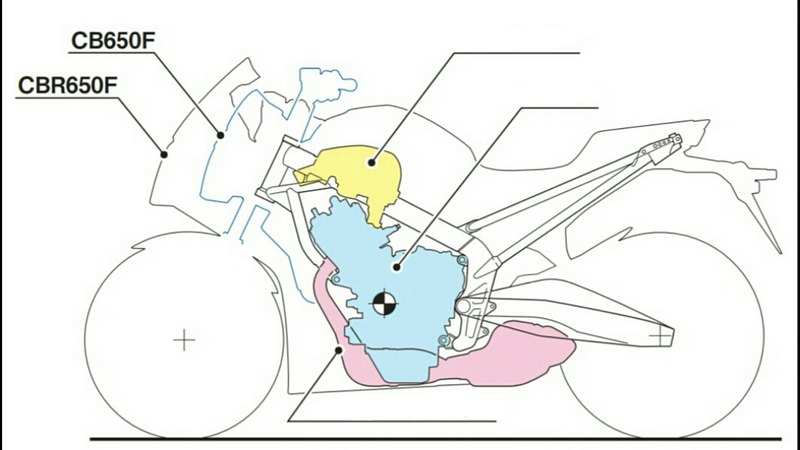 The riding position is naturally upright and slightly forward, placing the rider close to the bike’s center of gravity. 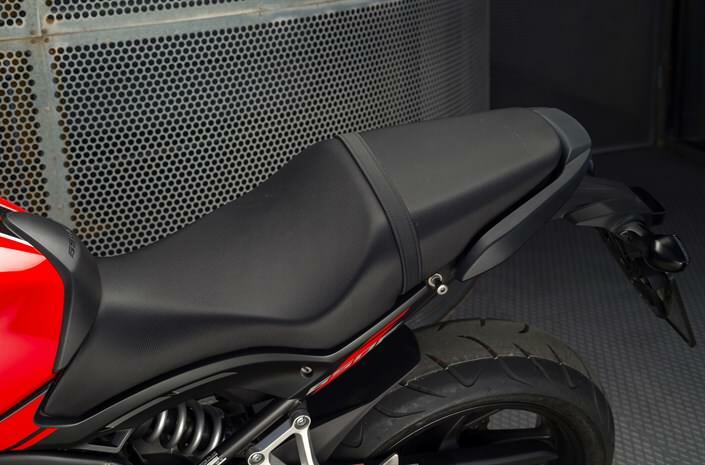 High, wide tubular handlebars give leverage and pillions get an ample seat and strap for security. 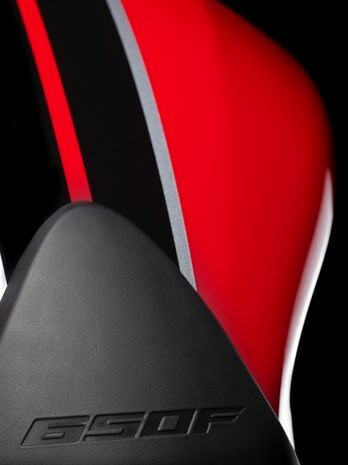 Seat height is 810mm and the narrow middle profile helps ground reach. 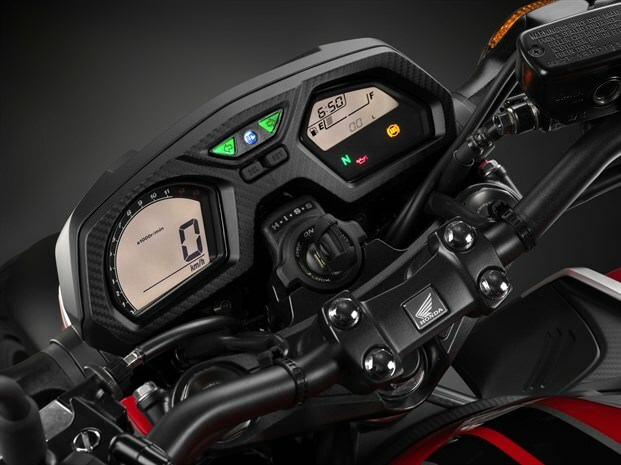 The dash comprises twin large digital screens. 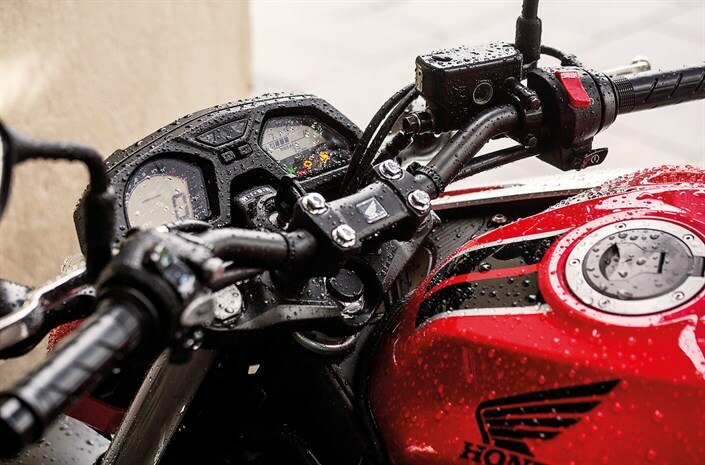 On the left are the rev-counter and speedometer; on the right are a fuel gauge, clock, odometer and the warning lights. 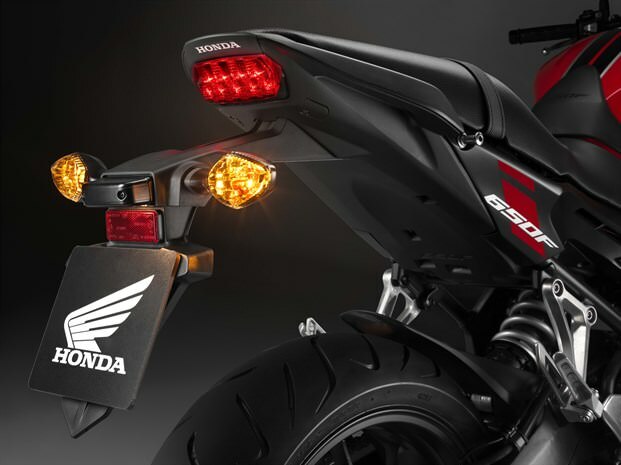 Both sides are lit by a white back light. 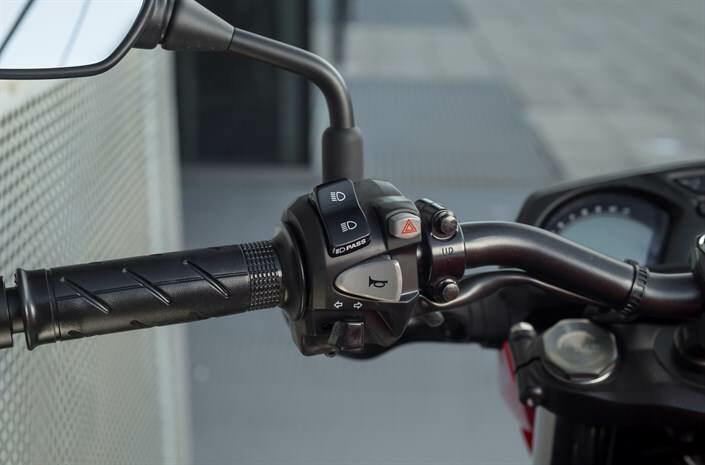 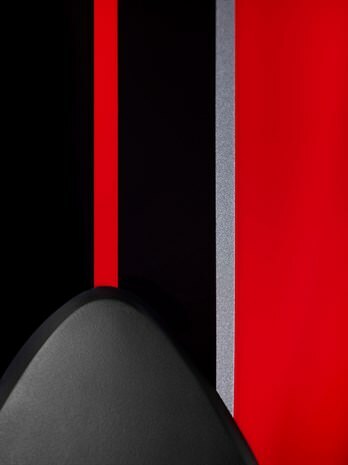 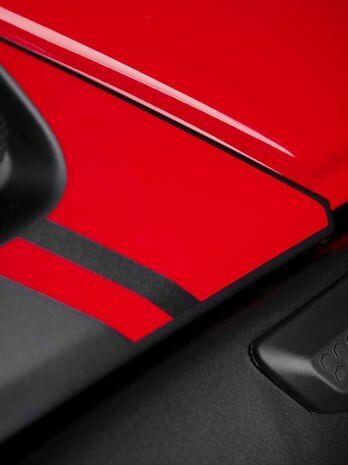 A compact ‘wave’ design ignition key offers improved security and reduced chance of breakage.